It’s no surprise that pre-Columbian South Americans once revered the jaguar as a potent symbol of power and strength – these enormous felines are some of the most impressive and beautiful members of all the large cat species, and the only Panthera species from the Felidae family that’s native to the Americas. These powerful predators are at the top of their food chain, and they have a current range that extends from the southwestern United States (though extremely rare in occurrence there) down to Mexico, Central America, and northern Argentina. While they do prefer rainforest habitat, they can also thrive across a range of forested habitats as well as more open living environments, especially those near water – jaguars happen to be talented swimmers. Interestingly, research into the DNA of the jaguar shows that it shares a common ancestor with lions and tigers, but the jaguar is the most similar in appearance to the spotted leopard. Their body is compact, muscular and stocky, with shorter legs than other big cat species, allowing them to skillfully climb, crawl or leap after their prey. Their tawny coats blend in exceptionally well with the dappled lights of their forested habitats, usually ranging from tawny yellow to red-brown in color, with black rosettes or spots over the body, neck and tail. Their underside is typically white, however, similar to other large cats. In some individuals, a color morph coat variation occurs, with the coat appearing almost black, but with spots still highly visible, while the completely melanistic coat variation (which is entirely black with extremely faint discernible spots) happens far more rarely. These jaguars are referred to as black panthers, though they’re still classified as the same species. A jaguar’s blocky, muscular head also means that it has an extremely forceful bite, allowing it to crush the heavy bones of its prey and even pierce tough turtle shells. These big cats can vary in weight and height, depending on habitat (more southern dwelling jaguars tend to be bigger), ranging anywhere from 125-210 lb and 25 to 30 inches at the shoulder, with males typically reaching sizes 10 to 20 percent larger than females. As the largest carnivores in Central and South America, jaguars are devastatingly effective hunters with a diet that includes over 80 species. Hunting mainly in the early evening and early morning, they prefer prey that’s as big or often even larger than they are, since they need to eat several pounds of food at a time to meet their energy requirements. They’ll even gorge on meat between hungry periods, and some jaguars have been seen to eat up to 50lb or more at one sitting. A jaguar’s diverse buffet includes caimans, deer, tapirs, dogs, anacondas, fish, sloth, monkeys, frogs, mice, and armadillos. Even sea turtles (which can reach an average weight of around 350lb) are on the menu. Because the jaguar has a physiology that’s more effective for simply overpowering its prey, it tends to stalk and ambush rather than sprint to catch each meal, quickly immobilizing it by biting the animal’s skull or grasping their head between paws and mouth to dislocate their neck. Jaguars will even hunt their prey into the water, since they can easily drag large prey onto the bank and up a tree, or to a more secluded spot to eat. Although they’ll return to larger kills multiple times, they’ll usually consume the more nutrient-dense heart and lungs of their prey in the first meal. Like many other large cat species, these fascinating hunters are solitary dwellers, with the exception of mothers and their cubs. Adults tend to secure sizable territories for themselves, marking them with urine, feces and scratch marks, but generally avoiding other jaguars outside of mating season. They will communicate to one another through various vocal antics. Roaring is used to warn competitors away, and grunts and mews are used during courtship and counter-calling. Any aggression or conflict that happens is usually between males when they intrude on each others territory. While jaguars have no specific mating season, they don’t reach sexual maturity until at least two years of age (males take three or four years). Both male and female will extend their territories during the time when the female is in season, although after mating they separate and the female raises the cubs entirely on her own to prevent the male from killing them (similar to tiger behavior). Cubs, born 3 to 4 months after mating, are usually born small, weak and blind in litters of two to four, weaning after three months but staying almost exclusively in their birth den until around six months of age. At this point, they start travelling with their mother on hunts, and eventually leave her side at one to two years of age to eke out their own territories. In the wild, the average jaguar lifespan is thought to be around 12 to 15 years, although some can live well over 20 years of age in captivity. Because of its role as an apex predator (at the top of its food chain), the jaguar has no natural predators in the wild, though it plays an important role in controlling the population levels of other, smaller species. 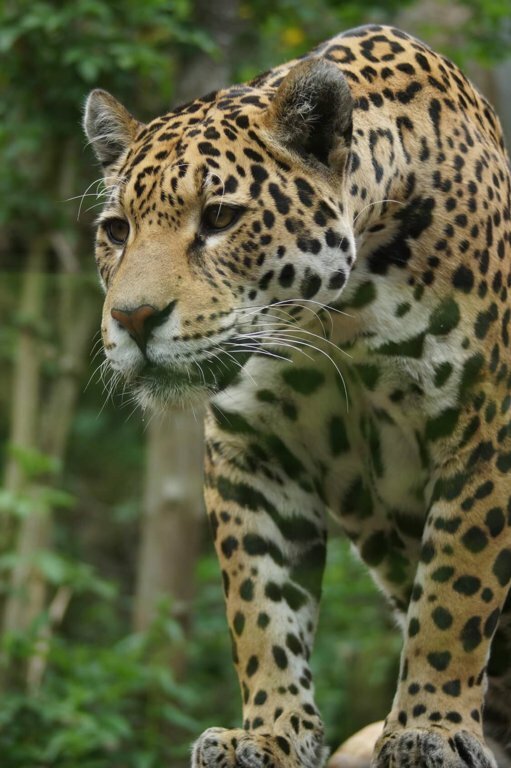 Threats from human activity are another story, however; the continued loss and fragmentation of jaguar habitat through deforestation is a major risk for most jaguar populations. Hunting is also another issue contributing to the decline in jaguar numbers; not only by poachers, but also by ranchers who shoot jaguars that prey on their livestock. Jaguars are currently listed as Near Threatened by the IUCN, is illegal to hunt in many countries, and trade in jaguars or their parts is prohibited internationally by CITES. Jaguars are rarely used today in circus acts, but are often displayed for entertainment at zoos. Jaguars kept captive in zoos are known for pacing due to the stress and frustration of their inability to carry out their natural routines and behaviors. Their stressful pacing increases as the number of visitors and noise level increases. Zoo jaguars are deprived of their natural environments and social structures for profit and human amusement.